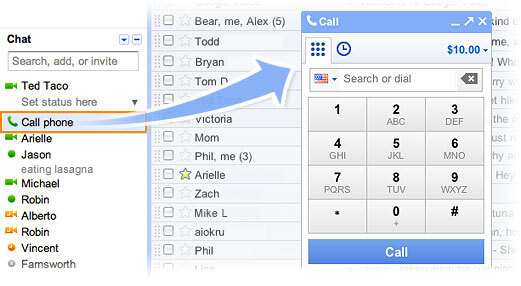 This year, Google added an extension of their Google Voice VOIP calling feature to the Gmail interface. Simply by logging into your Gmail account and typing in a phone number, you can call friends and family anywhere in the world. To promote the service, Gmail promised to keep calls to numbers in the U.S. and Canada free throughout 2010. For U.S. and Canadian citizens abroad, this was great news, as it meant that keeping in touch with your family and friends was free and as easy as keeping a browsing tab open to your Gmail account. But, and here's the reason for a news update: Last week the official Gmail blog announced that calls to the U.S. and Canada will remain free throughout 2011. So, you can enjoy your free Gmail calls throughout the new year! By the way, another great feature of the Gmail calling is its simplicity. Google stressed this point in one of their holiday gift ideas: A tech support care package for parents, including a step-by-step video guide of how to make calls in Gmail. If your family has trouble keeping up with new software, check these videos out and consider sending an e-mail through the www.teachparentstech.org home page. Finally, it is worth mentioning that for calls outside of the U.S. and Canada, Gmail doesn't necessarily offer the best rates. If you plan to place calls to other countries, it's worth making rate comparisons between Gmail and it's more well-known competitor Skype. For example, calls to mobile phones in Japan appear to be a bit cheaper per minute through Skype. Here are the complete rate tables for Skype and the rate tables for Gmail.